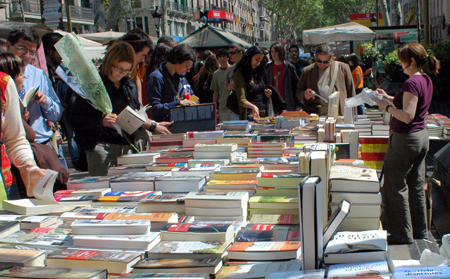 This Sunday, 23rd of April, Barcelona is going to relive the Sant Jordi’s legend with hundreds of books, roses and activities distributed through the whole city. Bookshops, florists and, also, all kinds of entities are going to take the stands out to the streets this 23rd of April, adorning the sidewalks of Barcelona with their decorated roses and the best sellers of the year. So, if you are nearby, you won’t be able to resist the temptation of stopping there and buying some of the literary wonders which are hidden among the piles of books, and you will leave taking away roses for all your loved ones. On the other hand, remember that the Sant Jordi’s tradition has progressed. Now, it isn’t a rose for the lady and a book for the gentleman. Luckily, these differences have been left behind, but not the spirit. Culture and beauty are now joined together, in order to create one of the best presents of the year among the people who really want to participate. If you want to enjoy this day 100%, you also need to leave the car behind. The streets of the center in Barcelona, with a complex access for motor vehicles, are going to be fuller of people this day. Our tip? Take a bike and also enjoy the pedaling to the center. The story is about a tyrant dragon who threatened the population of the Montblanc village and a courageous knight, who riding his white bicycle… was it not like this? This 23rd of April, coinciding with the weekend, in Barcelona and everywhere in Catalonia everybody will celebrate one of the most emblematic traditional festivities, the Sant Jordi’s Day, patron of Catalonia. This Day is focused on two different key elements: love and culture. We will find both represented in the thousands of street market stands with roses and books which are going to be present at the main streets in the city, whereby Passeig de Gràcia and Rambles are the protagonists. In addition to the obligatory walk through the Rambles, each neighborhood of the city will be celebrating all kinds of activities for every age. Not only books will be the protagonists of the culture, at Tiquet Rambles (Palau de la Virreina, La Rambla, 99), from the 14th of April, the tickets of a great diversity of performances (theater, dance, museums…) are being sold at reduced prices. A perfect celebration for the promotion of the small businesses, such as bookshops and other kinds of social organizations which will sell their roses in the street. Take your bicycle, ride it through Barcelona and discover the famous legend of Sant Jordi, the real one, being guided by the people from Barcelona.